A color map of the side of Pluto that always faces Charon. Credit: E.F. Young, R.P. Binzel, and K. Crane. Pluto has an exceptional orbit (A) that is both relatively inclined and decidedly eccentric. Here (1) it is compared with that of Neptune (2). At perihelion. 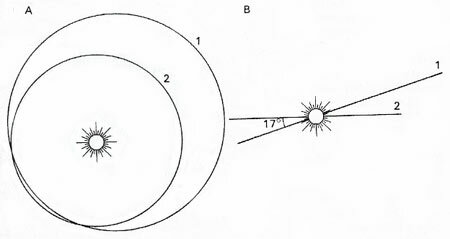 Pluto may come within Neptune's path but the inclination of 17° (B) means that there can be no collision. Hypothetical model of Pluto's interior. Pluto is a dwarf planet of the subcategory known as plutoids (see below), smaller than the eight 'classical' planets of the Solar System and usually farther than Neptune is from the Sun. Pluto is only two-thirds as big as our own Moon and has only one-fifth of the Moon's mass. Its size had led to astronomers to question for some time whether Pluto should be called a planet at all. 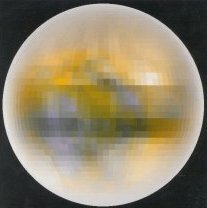 The debate about Pluto's status intensified in 2005 when it was shown that Eris (formerly known as 2003 UB313), an object further out in the Kuiper Belt, might be larger than Pluto (although a more recent estimate suggests that Eris is about the same size or slightly smaller than Pluto). On August 24, 2006, at a meeting of the International Astronomical Union (IAU) in Prague, astronomers voted to downgrade Pluto's status. It is no longer considered to belong in the same category as Mercury, Venus, Earth, Mars, Jupiter, Saturn, Uranus, and Neptune. Instead it has been placed in a new category of "dwarf planets." It has also been given the minor planet designation of 134340 Pluto. However, this decision to demote Pluto is opposed by several hundred astronomers. In June 2008, the IAU defined a new subcategory of dwarf planets to be known as plutoids. A plutoid is any dwarf planet that orbits beyond Neptune. Only four known objects belong to this category: Pluto, Eris, Haumea, and Makemake. Pluto was discovered by the American astronomer Clyde Tombaugh at the Lowell Observatory in 1930 and is named after the Roman god of the underworld. The name was first suggested by an English schoolgirl, Venetia Phair, and was quickly accepted by the astronomers at Lowell, who also noted that its first two letters are also the initials of Percival Lowell, the founder of Lowell Observatory. To begin with, it was thought that Pluto might be the long-sought-for Planet X, a world beyond the orbit of Neptune that was believed to be disturbing the movements of Neptune and Uranus. But astronomers quickly realized that the mass of Pluto was much too low to have any noticeable effect on the orbits of its inner neighbors. Tombaugh had been searching in a part of the sky where his calculations indicated that Planet X might lie. However, it's now known that there are no unexplained perturbations in the orbits of Neptune and Uranus. Tombaugh's discovery of Pluto, by use of a blink comparator, turned out to be just a lucky accident. Pluto has a far more eccentric – stretched-out – orbit than any of the eight classical planets of the Solar System. Most of the time, Pluto is much farther from the Sun than is Neptune. However, for about 10 years on either side of perihelion its elongated orbit carries it closer to the Sun than Neptune. The last time this happened was at the end of the twentieth century, from January 21, 1979, to February 11, 1999 (perihelion was on September 5, 1989). Pluto's orbit is also unusual in being highly inclined and in having a 3:2 resonance with that of Neptune, so that Pluto completes three orbits for every two of Neptune. There is no danger, though, that these two worlds will ever collide. As Pluto approaches perihelion, it also reaches its maximum distance from the ecliptic due to its 17° orbital tilt, so that it is always far above or below the plane of Neptune's orbit. In fact, Pluto and Neptune never come closer than 18 astronomical units (AU) apart. Unlike most of the eight classical planets, but similar to Uranus, Pluto spins on its side – that is, with its poles almost in its orbital plane. This extreme axial tilt, together with the high orbital tilt, makes for pronounced seasonal climatic changes – though, of course, it is always very cold! Pluto has very thin atmosphere with a surface pressure 100,000 times less than that on Earth. It is composed of 98% nitrogen and small amounts of methane and carbon monoxide – much like the atmosphere of Neptune's moon Triton. Pluto's atmosphere gradually freezes and collects on the surface as the planet moves away from the Sun. Yet, interestingly, observations have shown that between 1989, when Pluto was at perihelion, and 2002, the atmospheric pressure increased threefold. The explanation probably has to do with the fact that materials take time to warm up and cool off, which is why the hottest part of the day on Earth, for example, is usually around 2 or 3 p.m. rather than local noon, when sunlight is the most intense. The fact that Pluto's atmosphere is still building up rather than freezing out, as many scientists expected, is good news from the standpoint of what the New Horizons probe, launched toward Pluto in 2006, might learn of this enigmatic world. The structure of Pluto is not very well understood at present. 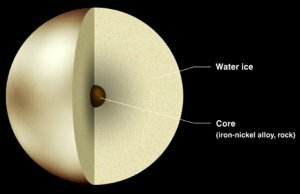 The accompanying diagram shows one possibility – a very small metal core surrounded by a thick mantle of water-ice. Spectroscopic observation from Earth in the 1970s has revealed that the planet surface is covered with methane ice. Surface temperature is about -230°C, and the frozen methane exhibits a bright coloration. However, with the exception of the polar caps, the frozen methane surface is seen to change to a dark red on the basis of observation of eclipses by its moon Charon. Pluto has five known satellites. The largest of these, Charon, is so big in comparison with Pluto – more than half its diameter – that the Pluto-Charon system is often referred to as a double planet. The average separation distance is 19,640 kilometers (roughly eight Pluto diameters). Uniquely, among planets in the solar system, Pluto has a rotation period exactly equal to that of one of its moons (Charon). Although it is common for a satellite to travel in a synchronous orbit with its planet, Pluto is the only planet to rotate synchronously with the orbit of its satellite. Thus tidally locked, Pluto and Charon keep the same faces toward each other as they travel through space. From 1985 to 1990, Earth was aligned with the orbit of Charon around Pluto enabling daily observations of the mutual eclipses of the pair. The data collected showed that Pluto has a highly reflective south polar cap, a dimmer north polar cap, and both bright and dark features in the equatorial region. Its geometric albedo ranges from 0.49 to 0.66, compared with Charon's (darker) 0.36 to 0.39. This difference, together with Pluto's higher density (between 1.8 and 2.1 grams per cubic centimeter compared with Charon's 1.2 to 1.3 grams per cubic centimeterm), suggests that the two bodies formed separately rather than as the result of a single collision, though this is by no means certain. Pluto's higher density indicates it is made of 50% to 75% rock mixed with ices, whereas Charon seems to be mostly ice with very little rock. Two small outer satellites were discovered in 2005, a third in 2011, and a fourth in 2012. See Pluto, moons. Several odd facts about Pluto, especially its highly inclined and eccentric orbit and its small size, led to early speculation that it might be a moon of Neptune that escaped. The modern view, however, is that Pluto is a displaced Kuiper Belt object. Pluto is the only planet unvisited by spacecraft. However, this will change in 2015 when the New Horizons probe flies through the Pluto-Charon system.